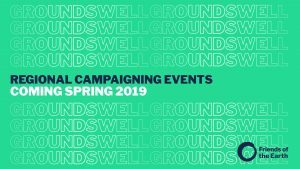 Groundswell; Friends of the Earth events in Birmingham and Bristol! There are also events in Darlington, Cambridge, London and Manchester, should those dates suit you better. Click here to find out more about them! Anyone attending, please report back and share, share, share!